All “True Draco” and “True King” monsters on the field gain 300 ATK and DEF. The first time each Tribute Summoned “True Draco” or “True King” monster would be destroyed by battle each turn, it is not destroyed. Once per turn: You can destroy 1 other card you control or in your hand, and if you do, add 1 “True Draco” or “True King” card from your Deck to your hand. As the last time we reviewed this card, I don’t have too much to say about such a busted, simple card. With up to 6 presence is any deck thanks to Terraforming, Diagram was a glue-type spell that made any situation you desire a reality. It boosts, it protects, it searches. The Triple Crown of Yu-Gi-Oh. And because it’s so good, I can’t imagine all of true King/Draco’s pieces will be available for a while. While I’m surprised Diagram didn’t get hit like it did in the OCG, the deck itself still got destroyed, as the TCG is more willing to do early into an archetype’s dominant run. Regardless, this card was an automatic inclusion on the Top 10 List for 2017. Dragonic Diagram, a card that is banned in the OCG, and unlimited in the TCG. Field Spell that can be searched like all Field Spells, DD works with the True King and True Draco archetype. 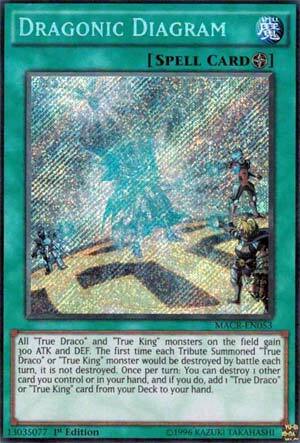 Protection from the first destruction of any tribute summoned True King or True Draco makes it harder for opponents to destroy your boss monsters. The 300ATK/DEF boost is nice, but not a game-changer. Pop a card on the field or in the hand for a True King/Draco search, there’s your game-changer effect. If you can drop a few True King or True Draco monsters into another archetype you can run this and reap the benefits of this card. Mealfoes, Fire Kings, Mermail, Dinosaur, anything that gets an effect when destroyed and sent to the grave can benefit from this card. While the best True Draco may be banned, the True King monsters can combo in many decks that run Continuous Spell/Trap cards. This card can see itself in many deck, and making a difference in all of them. We end the week off with the number 6 slot of the Top 10 New Cards of 2017, and one I would of honestly expected to be a little higher, Dragonic Diagram, from Maximum Crisis. Diagram is a Field Spell, meaning Terraforming searches it. While Diagram is on the field, True Draco and True King monsters gain 300 ATK and DEF. The boost is irrelevant as to why this card is good, but nice to have I guess. The first time a Tribute Summoned True Draco or True King would be destroyed by battle, it is not destroyed. Nice little protection for your Tribute Summoned monsters since you had to give up a resource or two to get it out. Once per turn, you can destroy a card on the field or in the hand to add a True Draco or True King from the deck to the hand. The cards this can search is absurd. Master Peace is an outstanding Boss Monster, the True Kings are great for decks like Dinosaurs and Fire Kings, and the smaller True Dracos make the True Draco deck as a whole very consistent, which is why Dinomight Knight is banned and Ignis Heat is limited. One of the best Field Spells in years, and I was shocked when the aforementioned Dinomight Knight and Ignis Heat as well as the Earth True King took hits instead of this card and Master Peace, they are still amazing cards in this game and can still get away with YCS tops.